The Pentax K-1 II is coming out soon for $2000 with a free battery grip [see Stock Status Tracker]. If you can’t wait or if you prefer the first generation Pentax K-1, its price has now dropped to $1700 at Adorama with free Overnight shipping along with the Pentax D-BG6 battery grip and an extra D-LI90 battery. The same price/bundle but not with free overnight shipping (you get expedited shipping instead) is available at B&H Photo. On the same listings, you will also find the K1 with 28-105 for $2400 with free battery grip and extra battery but no free overnight shipping option and no additional free accessories. More Pentax action, we have a better deal on the Pentax KP since last week when we posted our APS-C DSLR price chart. Now the Pentax KP body only is getting the 50mm f1.8 DA Pentax lens for FREE while remaining at $897 with free shipping at B&H Photo and Adorama (which includes a free camera bag, 16GB SD, Corel software, lens filter, etc) for the same price. We have not one but two medium format deals this week 🙂 Also part of the B&H WPPI festivities, you can get the new condition Pentax 645Z medium format DSLR body only offered for $4997 with free expedited shipping and 4% promotional rewards, which, in this case, is a pretty solid amount, 4% of $5000 = $200 to spend in the future at B&H Photo! But that’s not all. On the same listing, B&H has three “take pictures with” kits. With the 55mm f2.8 you pay $6000, or with the 75mm f2.8 you pay $5694, or with the 28-45mm f4.5 you pay $9246. No 4% promotional rewards with the “with lens” kits. Speaking of the upcoming K-1 II, Amazon itself is now accepting pre-orders for $2000 but unlike Adorama and B&H Photo, Amazon does not currently include the Pentax D-BG6 for FREE with pre-orders. Eventually the Amazon AI Bots may wake up and add it but for now, it’s not included. Today is the most productive day of 2018 so far blog-wise it seems. I just added the brand new Pentax K-1 II full frame DSLR to the Stock Status Tracker. And since our pre-order post, we have another development, now B&H Photo too is offering a free Pentax D-BG6 battery grip with pre-orders. I also did some remodeling in the sidebars and menus of both this blog and the Main blog, mainly to add the new Cameras and Lenses of 2018 tracking page, along with the brand new (in progress) Price Charts series. While the Pentax K70 body only remains at $600 [versus our November 2017 snapshot], the official K70 with 18-55 “take pictures with” has dropped $50, currently going for $647 with free shipping at Adorama (with free Lowepro 140 bag, 16GB SD, etc) and B&H Photo (no freebies). The Pentax K3 II APS-C DSLR is still alive and kicking. It currently goes for $830 in new condition as the body only. For the same price, Adorama is offering it with a FREE Pentax D-BG5 Battery Grip. The free battery grip is included by Adorama automatically while this promotion is running. You see it mentioned on the product page. With free expedited shipping. If you have B&H gift cards or promotional rewards, they are close, they are offering the K3 II + Battery Grip combo for $836.50 with free expedited shipping. Yesterday we completed the 35mm Full Frame Price Charts write-up. Now the process has began for the APS-C DSLRs version with the price-checking round! 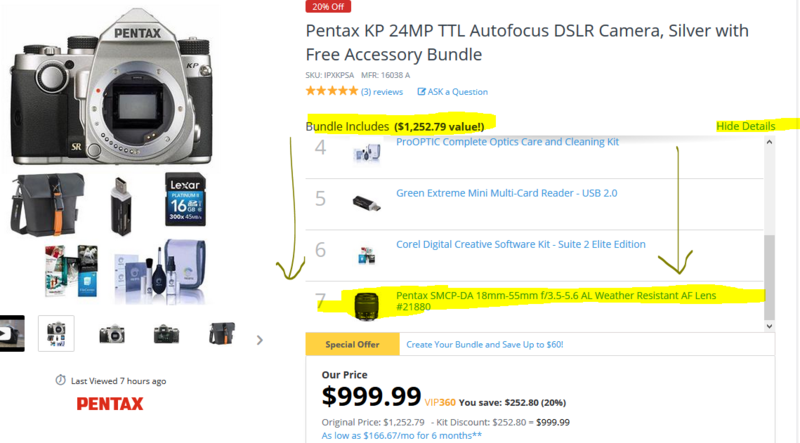 The Pentax KP is down $100 since the November 2017 APS-C price charts and it is getting a handful of free accessories for its new $900 price at Adorama. But if you don’t want/need the extra accessories or want a “take pictures with” kit, then $947 will get you the black Pentax KP with 50mm f1.8 DA with free expedited shipping at B&H Photo. 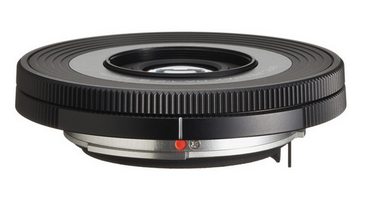 The lens goes for $110+ on its own, so you are essentially getting it for half price. The silver KP is not eligible for this promotion, but you can purchase it together with four different Pentax lenses for a combined purchase discount. You can see them all at the main Pentax KP listing at B&H Photo. This promotion continues! If you are a Prime member and pay for the purchase with a Prime credit card (only Prime members can have a Prime credit card), the Prime 20% Cashback Offer continues offering a variety of Pentax DSLRs and lenses, which is nice since Pentax gear doesn’t get as many deals as offers. This offer is bit more complicated, so please read carefully! The Pentax K70 body only goes for $600, while the K70 with the 18-135mm goes for $850 at B&H Photo and Adorama in either the black or the silver color schemes. The same prices are available at Amazon by Amazon actual. Of these kits, only the K70 with 18-135mm kits are eligible for the 20% statement credit IF you pay with a Prime credit card. You pay $850 at checkout, and after your credit card statement closes, you receive a $170 statement credit. If you purchase the K70 body only from Amazon, and pay with a Prime credit card, you will only receive the standard 5% statement credit, not a 20% statement. Only the “K70 with 18-135” kits are eligible. The two Pentax K-P bodies range from $880 to $900 at Adorama and B&H Photo. 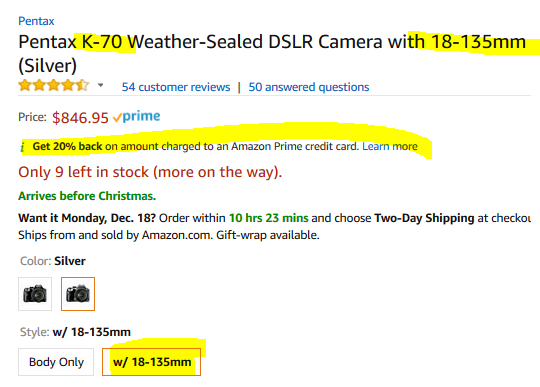 The same prices are available at Amazon by Amazon itself. But if you are a Prime member, and PAY with either Prime credit card, you will receive a 20% statement credit, around $176 for the silver KP and around $180 for the black KP. For more details on the 20% statement credit offer, read the introductory post, I don’t want to repeat the whole thing in every post. The Pentax K-1 body goes for $1900 with a FREE Pentax D-BG6 Battery Grip at B&H Photo and Adorama. It also goes for $1900 at Amazon by Amazon itself but Amazon does not include the free Battery Grip. HOWEVER, if you are a Prime member, and you pay for this purchase sold and shipped by Amazon, paid with either Prime credit card, you will receive $380 back as a statement credit! I don’t want to repeat the details of this promotion in every post, read the introductory post here. The battery grip costs $220 on its own, so the statement credit offer handily defeats the free battery grip. On the Pentax K-mount, a total of 29 Pentax lenses are participating in the latest B&H Photo Pentax Instant Savings promotion. Some (but not all) of the lens offers expire Saturday at 11:59pm ET. Note however that B&H is not accepting orders between Friday PM and Saturday PM, so factor that in your planning! Some of the lenses earn 4% promotional rewards. Prices range from $92 (50mm f1.8 DA) up to $4000 (560/5.6). There is a mix of zooms and primes, including some of the f2.8 PRO zooms and their Limited Primes. Last call! The current Pentax Lens Instant Savings promotion is expiring at 11:59pm ET on Thursday at B&H Photo, featuring 24 lens options, with a mix of zooms and primes, and prices ranging from $92 (50mm f1.8DA) to $4000 (560mm f5.6). And now, the moment you have all been waiting for! I am beginning a full price check of all cameras tracked in the Camera Price Charts. This will basically cover almost all of the DSLRs and mirrorless cameras, along with the serious fixed lens cameras with RAW (above 1/2.x” sensor size). Hide your wallets! 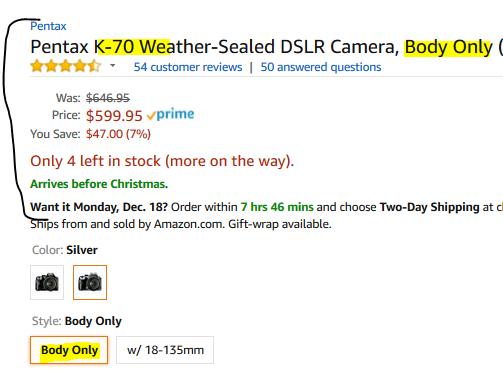 We start in K-landia where the Pentax K-3 II body only has dripped down to $830 with free shipping at Amazon by Amazon itself with a up to three units per customer. But if you want the official Pentax battery grip to go with it, the BG-5, you can get them together as a bundle for $847 with free shipping at B&H Photo. The Pentax K-1 body only is bundled with Pentax D-BG6 Battery Grip, together for $1900 at B&H Photo… The Pentax HD Pentax-D FA 24-70mm f/2.8ED SDM WR is on sale for $1100 with free shipping on its own as part of the B&H Black Friday sales… Or you can get them together for the same total price ($2994) as a bundle. The Pentax AF-330FTZ Zoom Flash currently has two used listings at Adorama in “Excellent Minus” condition for $13.50 plus shipping (around $5). This is an old model. The listings for it are bare bones, no picture, no description, but the manufacturer code is the correct one, PXSAF330FTZ. If you don’t see any used listings at the link above, it means they sold out. Adorama offers a 30-day return and 90-day warranty of their own, so you are covered in case there’s an error in the listing. So a bit of YMMV. The Pentax K-1 Silver Limited Edition (body only with official battery grip) is out of stock and cannot be ordered at Amazon and B&H Photo, but hope is not lost! Adorama comes to the rescue. As of the time of writing it remains in-stock and shipping for $2200 with free expedited shipping over there. Optional financing offers are available with the new Adorama Credit Card. Yes, Adorama has an official credit card, offered by Comenity Capital Bank per the listing over there. The new condition Pentax K-3 II body only goes for $846 in new condition at authorized dealers such as Adorama and Amazon itself. But if you forgo a supersized Starbucks frappuccino, for $853 with free shipping you can get the K-3 II body only with the official Pentax BG-5 battery grip for $853 with free expedited shipping at B&H Photo. $7 more for the battery grip is pretty, pretty, pretty good! Somehow I strayed from the alphabetical price-checking and finished the S-cameras before the P-cameras. To the P-cameras we go! The Pentax KP body only goes for $1000 in new condition at authorized dealers. At the moment, there is a promotion that for the same price you also get the Pentax SMCP-DA 18mm-55mm f/3.5-5.6 AL Weather Resistant AF Lens for FREE, such as B&H Photo in either the silver or the black color scheme. But wait, there’s more! At Adorama, for the same price, you also get a handful of free accessories, which if you don’t need, you can put them in various camera-related gifts during the upcoming holiday season 🙂 The additional freebies at Adorama are 24/7 Traffic Collection holster, 16GB Sandisk SD card, USB card reader, cleaning kit and the Corel software bundle (five titles as usual, AfterShot, PaintShop, VideoShop, etc). A rare medium format DSLR discount! The Pentax 645Z body only medium format DSLR camera is now down to $5497 at authorized dealers including B&H Photo and Adorama and various thru Amazon. B&H and Adorama offer 4% promotional rewards, which is about $220 to be used in future purchases at B&H or Adorama. Amazon does not have promotional rewards, but if you are a Prime member and pay with either one of the official Amazon credit cards, you get 5% back as a statement credit.